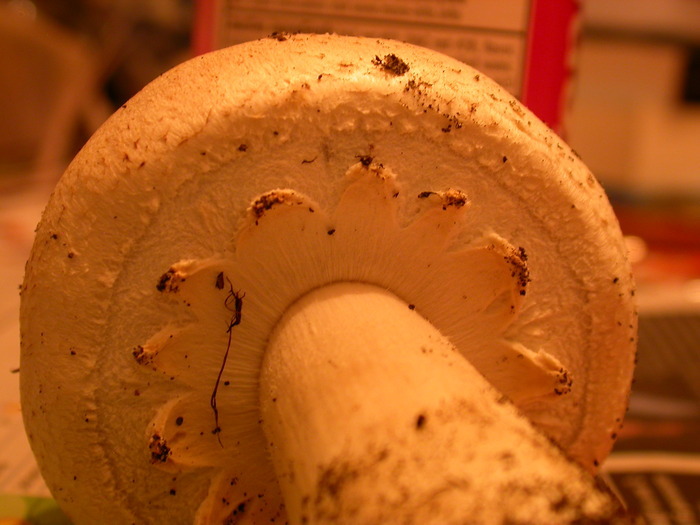 The caps of these didn't look very interesting: dry, cracked, light brown with white flesh. 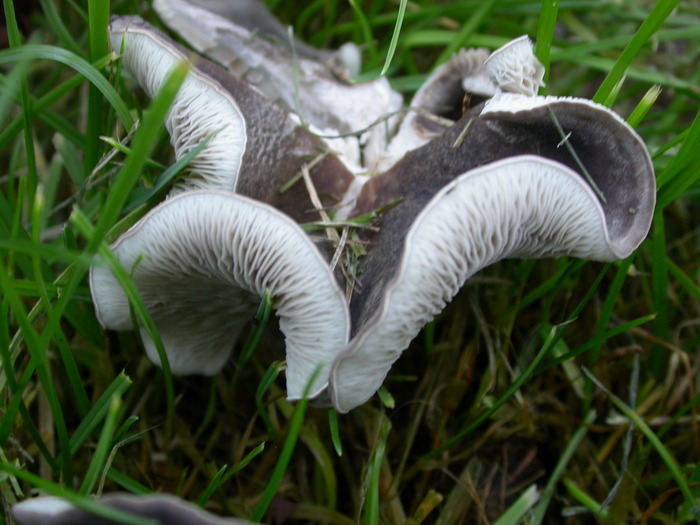 The pores on the underside though are definitely interesting. 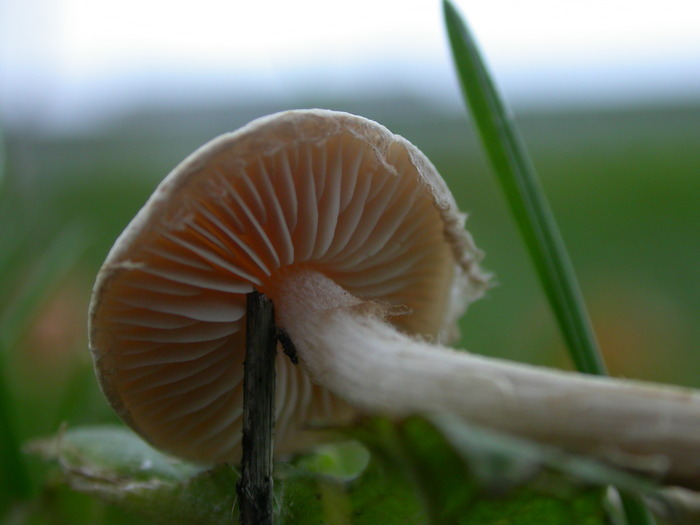 There are only a few species with white pores that stay white even in specimens as old as these, but none that seem to routinely have a cracked cap. 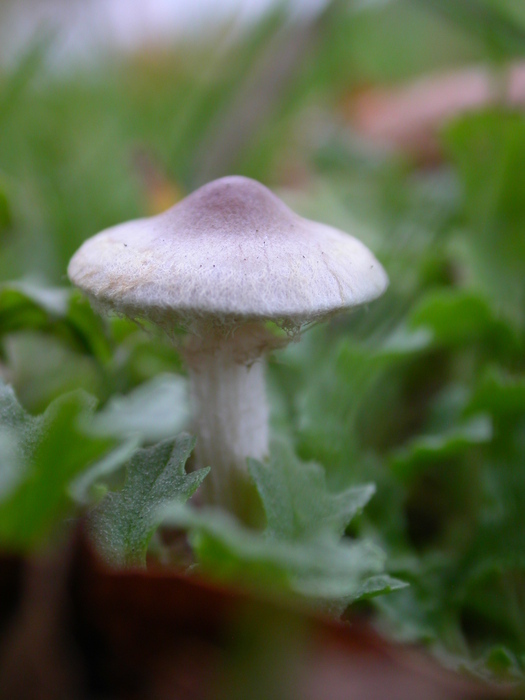 The fuzzy margin of this mushroom, and its slight purple tint, make it likely to be in the Cortinarius genus, but I haven't a clue what species. Another view of the same species. I brought home one of these big, white mushrooms out of curiosity. 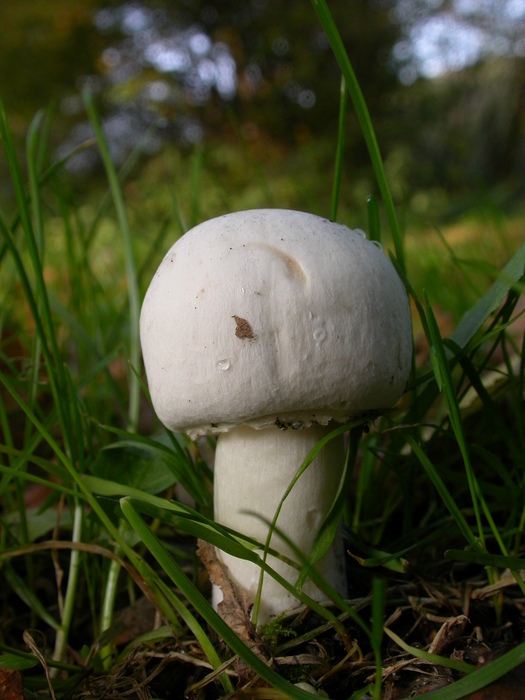 But careful examination has its rewards: I identified this as a Leucoagaricus, probably L. leucothites but maybe L. holosericeus. And there were great masses of them growing by one of the newly-planted trees along the bike path. 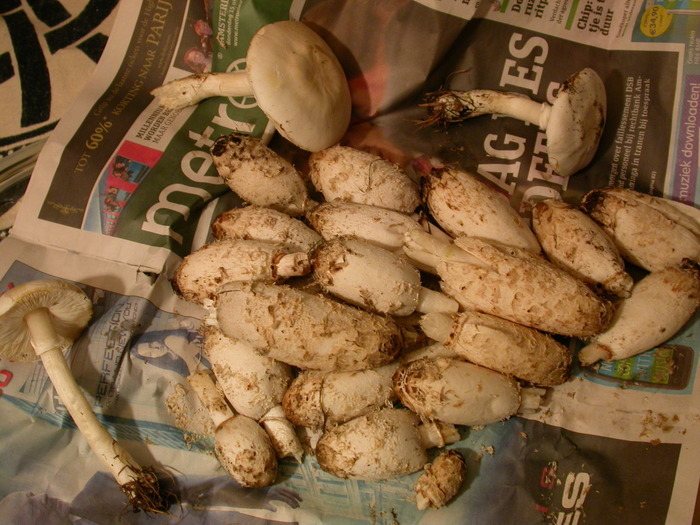 So I took a few of them home, and indeed, they taste very much like a familiar Agaricus bisporus (champignon) but, of course, with that lovely fresh flavor that you never get with purchased fungus. 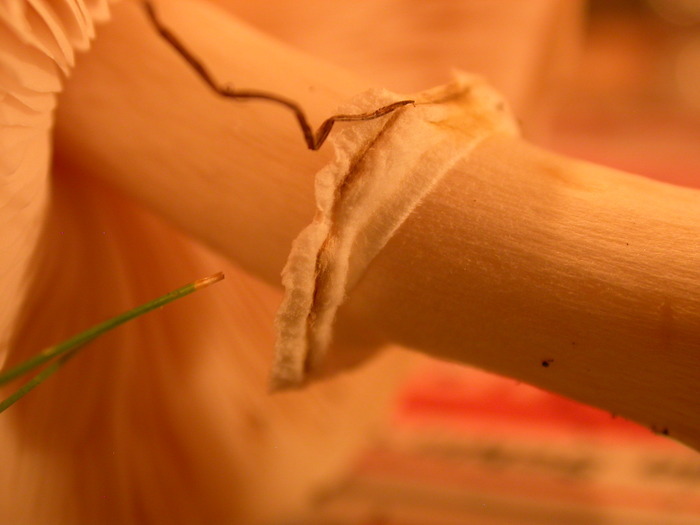 One of the things I love about mushrooms is their persistence. They seem to take particular delight in growing in strange places, and if that means getting stepped on early in life, then you just grow in a circle. This was not recently broken: it was quite solidly fixed into this shape. Another mushroom adapting to the rough life. 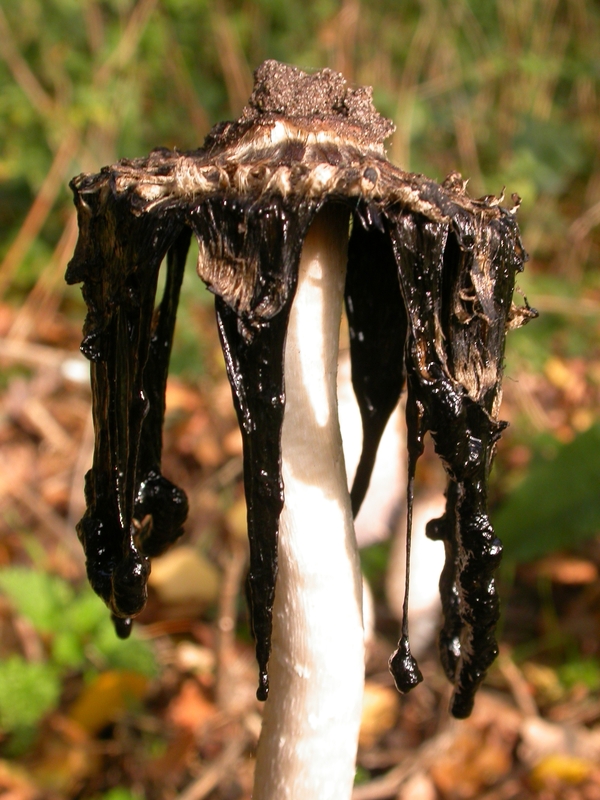 The mushroom season started late this year, but it made up for lost time with an explosion of shaggy manes. Yes, these are growing in with a bunch of thistles, and yes, I reached in to get them out anyway. Shaggies have the disadvantage of turning to ink within hours of being picked, but it is *well* worth racing home with them to put them on the fire. And sometimes they grow in such rewarding numbers... unfortunately it was getting dark already on my ride home, so this is the best picture I have of this group. And sometimes in bizarre places. We found these on the walk back from seeing Sinterklaas. But wait! I hear you say. 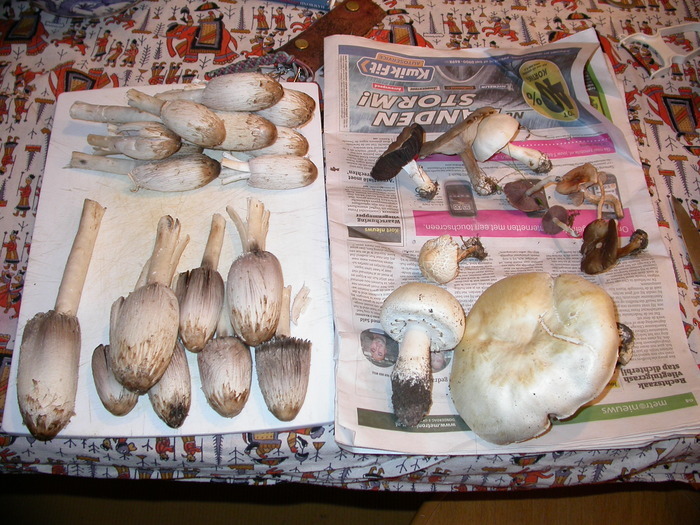 Those white Agaricus are not the same in both pictures. Very true. 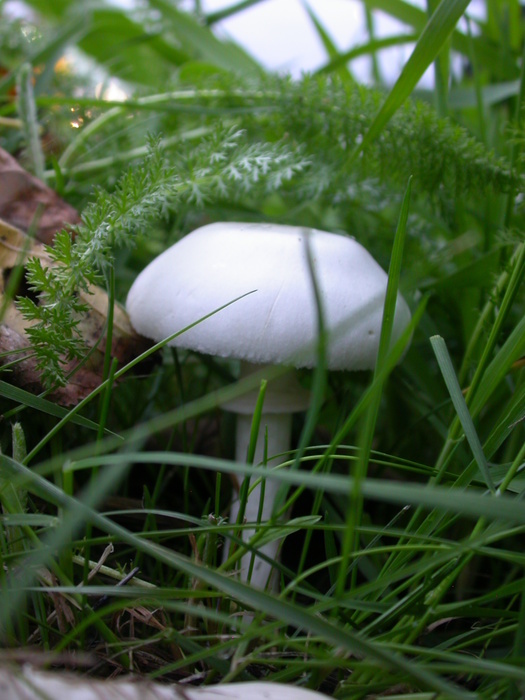 The second picture also has some Agaricus arvensis, the anise champignon. 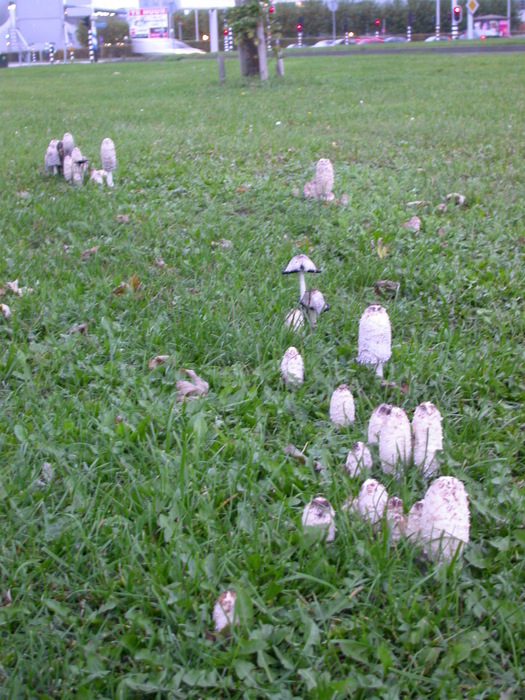 Those were growing on the lawn by the hospital. There were only a few growing, so I just picked a couple (one young and one old, in order to ID them properly). 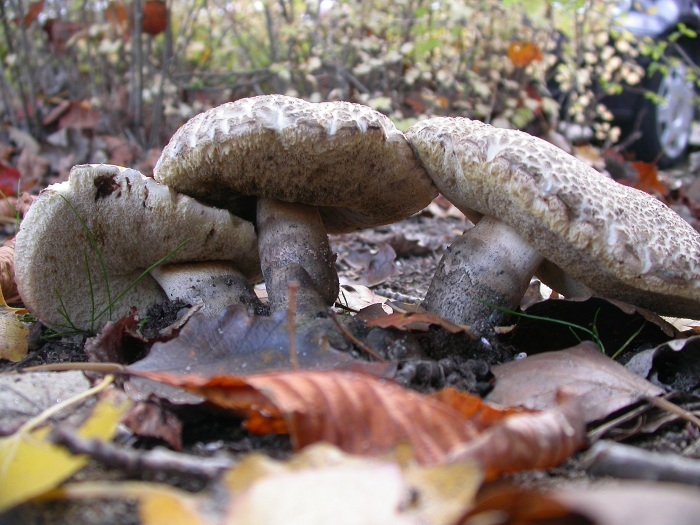 Some of the Agaricus will make you quite ill, so it's good to ID them properly. 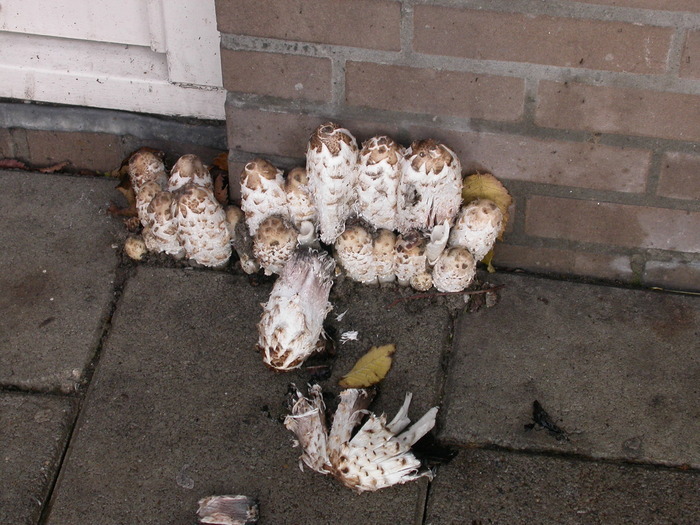 The lose-your-lunch-bunch are rather rare in the Netherlands though. 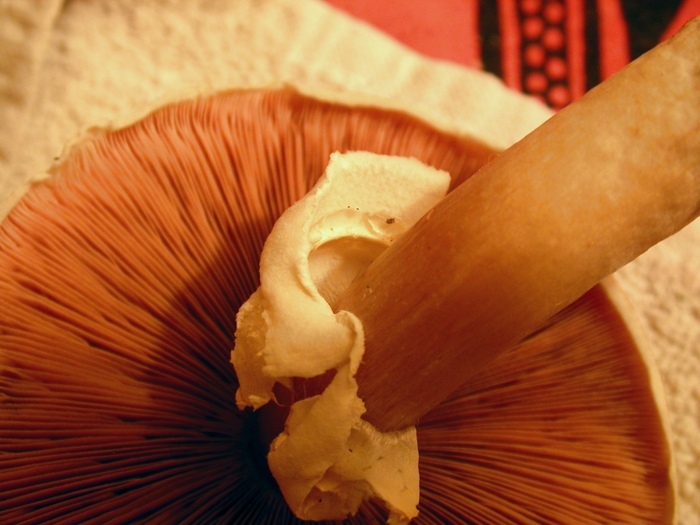 Note the cogwheel pattern in the veil of this mushroom. That's its main distinguising feature, apart from a distinctly sweet almond/anise smell. 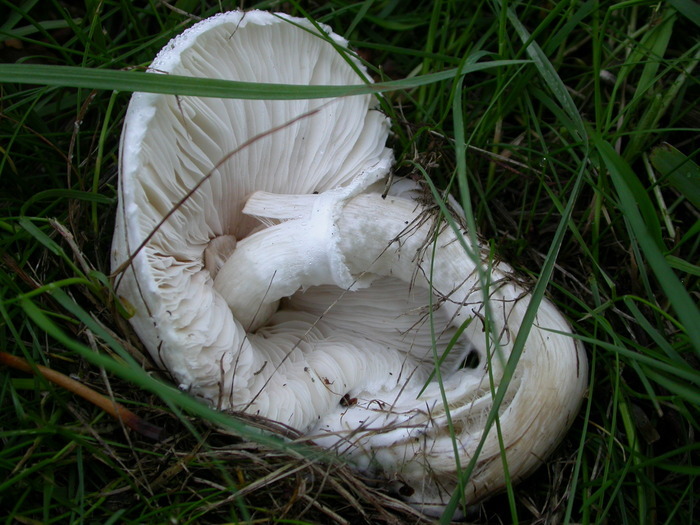 One of the Agaricus showing its pink gills. Not everything I find goes in the pot. 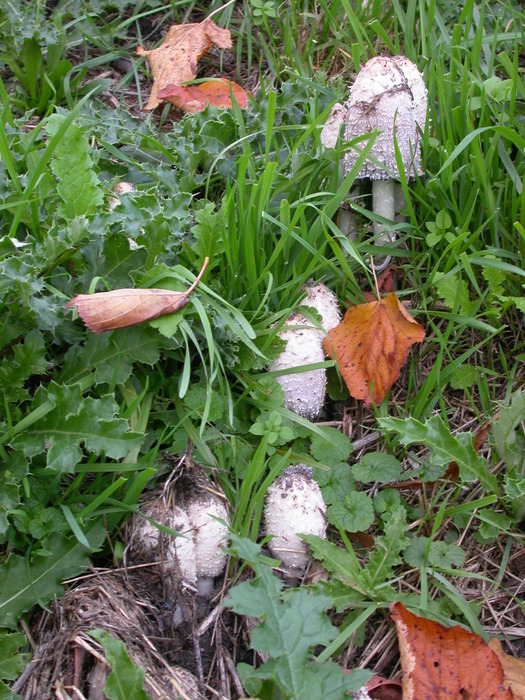 There were a few Agaricus growing on the other side of the canal by the hospital, but not enough to spare one for ID and possible cooking. 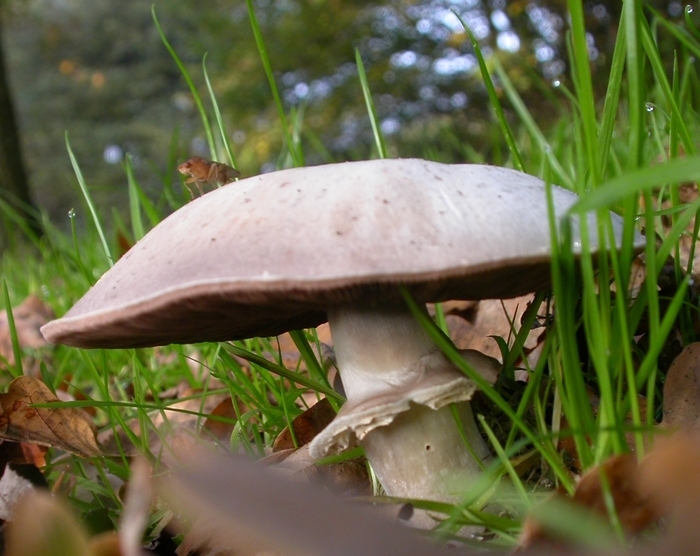 I like this picture of the Agaricus with the fly on top. Probably the same species, just younger. 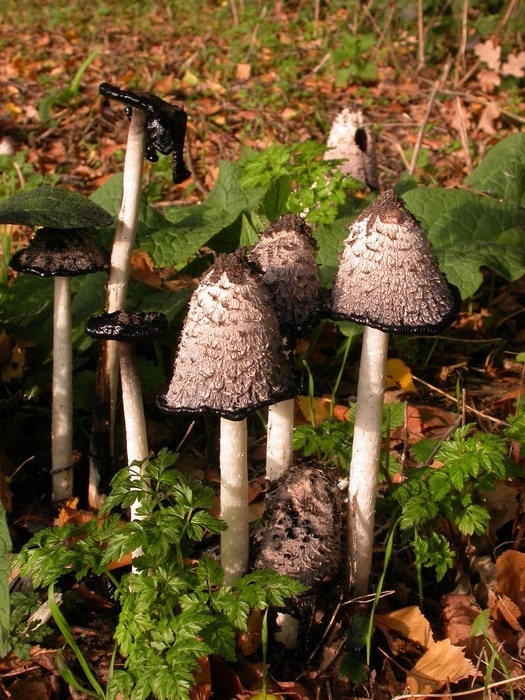 Shaggy manes going to ink. They're nifty in their own right at this stage. Found this in one of the eggs from the market. 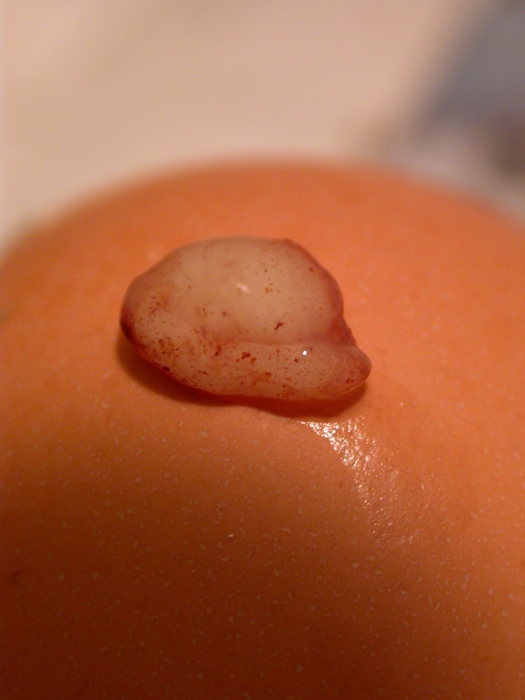 Is it a very tiny chicken embryo, or is it just some random tissue that formed in the egg? It doesn't look much like an embryo (no eye spot, no vasculature going down to the yolk, not much of anything really) but it's still possible. I'm voting on random tissue though. They are fairly common in the eggs here, whatever they are.